The gluten free world was recently sent into excitement by a glut of pizza announcements. The news that Pizza Hut, Domino’s and Prezzo were launching gluten free pizza bases was swiftly followed up by Ask Italian. I recently posted a review of the Pizza Hut gluten free offering, and with news that the Domino’s GF launch has been delayed until November 19th and the lack of an Ask Italian in Plymouth, I set out to try the Prezzo version. Prezzo are currently offering a voucher on their website offering two courses for £10. The voucher applies to the entire table, and as there were four of us this was a good deal. Unfortunately the offer expires 12th November. The Plymouth branch of Prezzo is situated in the Royal William Yard, which is fast becoming a gluten free hot spot. The restaurant itself is very well decorated and situated in a great location. It was also pleasing to see an Italian restaurant with several Italians on the staff. I decided to skip the starter and go straight for the main course. My wife was the only one to order a starter, some bruschetta, and nearly thirty minutes after ordering this hadn’t arrived. My wife chased this and it arrived a few minutes later, and I suspect there was a mix up in the kitchen. Mistakes happen and I always think it is better to judge a business on how they rectify a problem rather than whether they had one. The waitress apologised for the delay, had the starter out in a few minutes and offered a free round of drinks for the entire table to make it up to us. Great customer service after a rocky start. I of course went for the pizza for the main meal. I asked which toppings were gluten free, and was told I could have everything but the spicy beef. I had heard the same from a few people on Twitter, so this gave some reassurance. I quizzed the waitress with regards cross contamination and she seemed well informed. I am very sensitive to cross contamination and I am pleased to report I have had no reaction at all to this pizza. I did note that the menu did have a disclaimer that other gluten items were made in the kitchen, and they could not offer 100% guarantee that the kitchen was free from “airborne contamination”. Unless the kitchen is 100% gluten free, it’s pretty standard to get a disclaimer similar to this. There were no further delays in the service and our main course arrived shortly after. I would usually have gone for a meaty pizza, but wasn’t feeling particularly hungry so was going to order a margherita pizza as I thought it would be less filling. I had seen comment that the pizza’s here weren’t particularly cheesy, so at the very last second I changed my mind and went for the quattro formaggi. This was a bit of an error on my part as I hadn’t spotted it had gorgonzola on in my last second switch. I am not a fan of blue cheese so picked this off. There was also a bit too much goats cheese for my liking which overpowered the other cheeses, so I regretted my choice a little. The base itself was thin and tasty, it was crispy on the edges but quite soft in the centre. My parents enjoyed their gluten filled pasta dishes, but my wife wasn’t particularly impressed with her gluteny pizza, saying she would have liked it crispier. She tried my base and actually preferred it. I had scoped out the allergy information pre visit and had been excited to see the vanilla panna cotta was gluten free. However this was not on the dessert menu which was a shame, so I assume this is maybe a special. The only gluten free dessert choice was a hazelnet bombe. 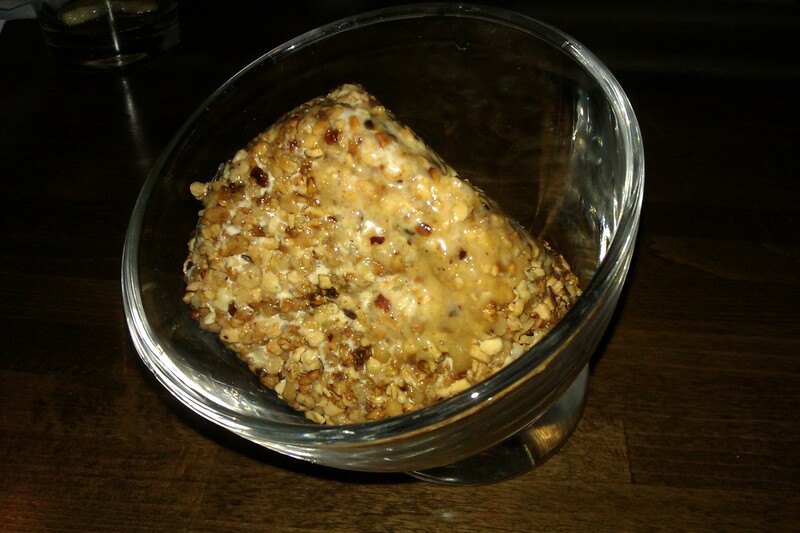 This was ice cream covered in chopped hazelnuts with a meringue centre. This was nice but was no panna cotta. It certainly would have been nice to have another gluten free choice for dessert. Overall I think I slightly preferred the Pizza Hut base, though maybe this is down to my poor topping choice influencing me. I’d be keen to try this again with a different topping and it’s definitely nice to have another gluten free option. I’d give this a good but not great verdict overall. 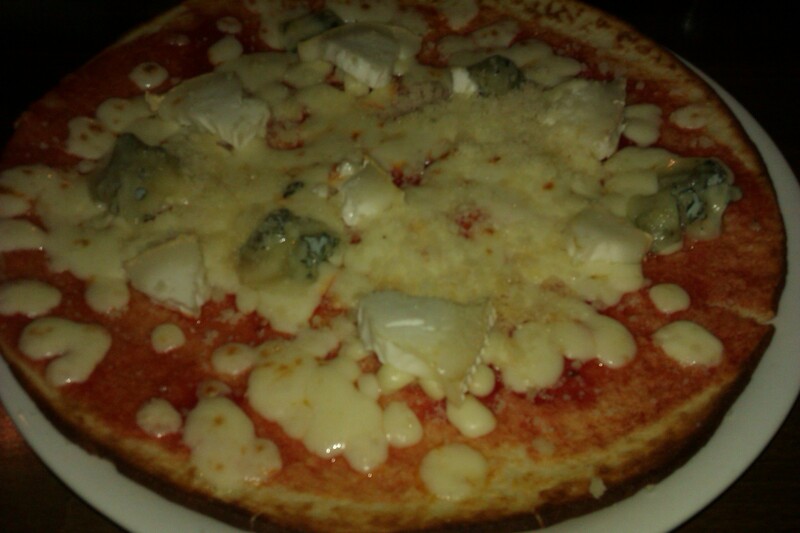 See comments on this post for reviews from couple of other people who have tried the Prezzo GF pizza. Next stop, Domino’s!